Mining Zcash can be a good option to make money using your GPU. All you need is an Nvidia GPU and you’re good to go. In this guide I’ll explain about Zcash Mining in general and also supply you with a step by step tutorial about how to mine. Getting started with Zcash mining is fairly simple. You don’t need to download the full Zcash blockchain or manage technical command-line miners with manual instructions. For the purpose of this guide, I’m going to do a detailed walkthrough of setting up and using the very popular Nvidia EWBF Miner. If you have AMD cards, mining Ethereum is probably the more profitable option. Step 5 – Start mining! First – before you dive into the steps for mining Zcash, I suggest you start of with our guide on what Zcash is. If you already know what Zcash is, let’s get more specific on Zcash’s network..
Zcash uses a different hashing algorithm than Bitcoin’s called Equihash, making it incompatible with the special mining hardware (ASICs) developed for Bitcoin mining. Equihash is designed to resist the development of Zcash-mining ASICs. Instead, it is deliberately best suited for GPU mining. Zcash also differs from Bitcoin because it has a built-in privacy protocol called zk-SNARKS, which is designed to make it the leading privacy-based crypto in the market (competing with other privacy coins such as Dash and Monero). Finally, Zcash has a 2.5-minute block time, compared to Bitcoin’s 10-minute blocks, and it produces a block reward of 10 coins per solved block. Zcash’s total network hashrate has been generally on the rise since its launch in late 2016. The rise in total network Hashrate reflects the amount of hardware dedicated to Zcash mining. So, how come this rise is not reflected in blocks being mined more rapidly to decrease the average 2.5-minute block time? Zcash is easily traded for bitcoins (BTC), so it can be a cheap way to slowly build up a holding position in Bitcoin. Since BTC can easily be exchanged for cash, mining ZEC can be a good way to indirectly fill your bank account or earn cash. ZEC can also be sold directly on some major exchanges. Mining can be a cheap entry ticket to the Zcash markets, which are loved by traders for their high volatility. If you’re a good and/or lucky trader, you can maximize your profits. Ever since ZEC hit the market, it’s been one of the highest-priced altcoins on the market, peaking at over $400 in June 2017. Mining can be a great way to subsidize the purchase of a new high-end GPU (or two, or three…). Finally, building a large ZEC position through mining now may allow you to take advantage of price appreciation in the future with less risk than you’d face by just buying ZEC. Let’s break this last idea down a bit further. Mining and holding crypto is similar to the old adage of buying low and selling high. However most buyers don’t know how to do technical analysis, so they buy and sell at the wrong times. They buy high during parabolic price increases and sell low during what could be normal price corrections on continued upward trends. Buying gear and mining cryptocurrency with it allows you to own an income-producing asset in the gear itself, with aftermarket resale value holding up very well. Allowing your gear to earn money and selling that gear when you reach your target can allow you to make nearly all your money back on the gear and pocket the crypto generated as profit. Now that you have a clearer understanding of the Zcash blockchain and important concepts such as difficulty, you can perform some economic calculations. 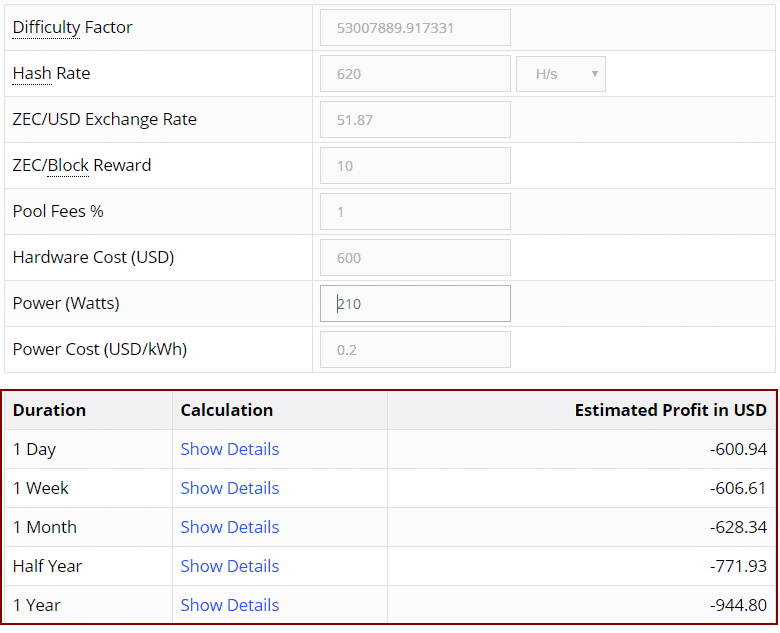 To do this, we created a Zcash mining profitability calculator so it is fairly easy. Difficulty Factor & ZEC/USD rate: These fields are updated automatically. If you wish to simulate scenarios, you can enter you own values manually. Hashrate & Power (Watts): Use this table to find the parameters per your GPU’s make and model. Make sure the hashrate measurement is identical between the table and the calculator i.e. MH/s, KH/s etc. Pool Fees % (optional): Enter your mining fees if you’re mining via a mining pool (usually run around 1%). Leave this blank if you’re mining solo (not recommended). Hardware cost (USD): Put here (in USD) how much you paid (or are about to pay) for your GPU and any other mining equipment. Power Cost (USD/kWh): Enter your electricity price, as appears on your utility bill. You can use this list for the USA or this list for elsewhere in the world. Also, remember that it may be necessary to buy a new Power Supply Unit (PSU) to run your hardware, depending on your intended setup. While an electrically-efficient PSU might cost more, it will also save on power costs for the long term. Even more importantly, it is crucial to remember that difficulty and price are variables i.e. they can and will probably change over time, possibly dramatically. In other words, the profitability score you get is only true to the present moment of calculation. Start off by reading our Zcash mining hardware guide for a complete list of available miners. Experimenting with various GPU selections in the calculator will help you uncover the card with the best price to performance to power consumption combination (expressed as MH/s per currency unit). When it comes to which GPU card you should choose, Nvidia would be your first choice. It’s important to note that while AMD cards outperform Nvidia cards for Ethereum mining purposes, Nvidia has a clear advantage when it comes to mining Zcash on the Equihash algorithm using the EWBF Miner. Whichever card you choose, it should have at least 1 GB of RAM, or it won’t be able to properly mine Zcash. The reason for that is that EWBF supports GPUs with just 1 GB of RAM, compared to Ethereum’s 3 GB requirement. (This is a correction from the video, in which I say that the min RAM is 3GB). 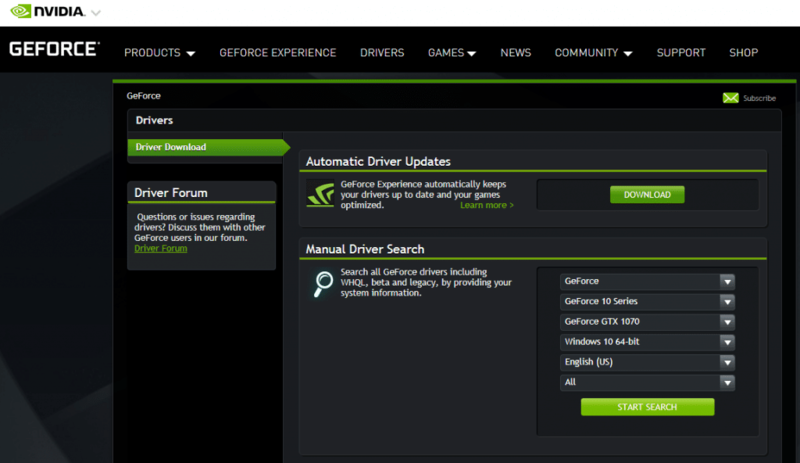 Nvidia GPUs: To get the latest Nvidia GeForce drivers, go to https://www.geforce.com/drivers. Enter your card info, and click Start Search. Download the current version from the results. 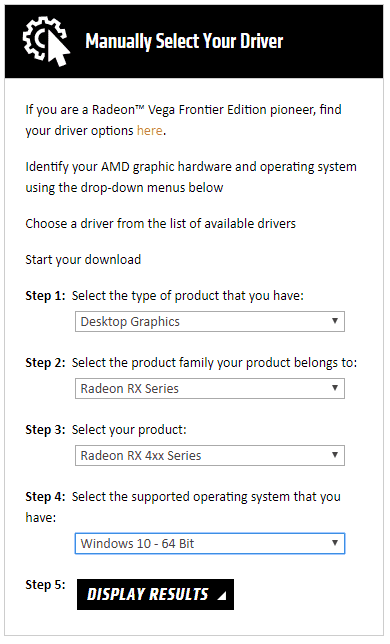 AMD GPUs: Go to amd.com, choose Support & Drivers. 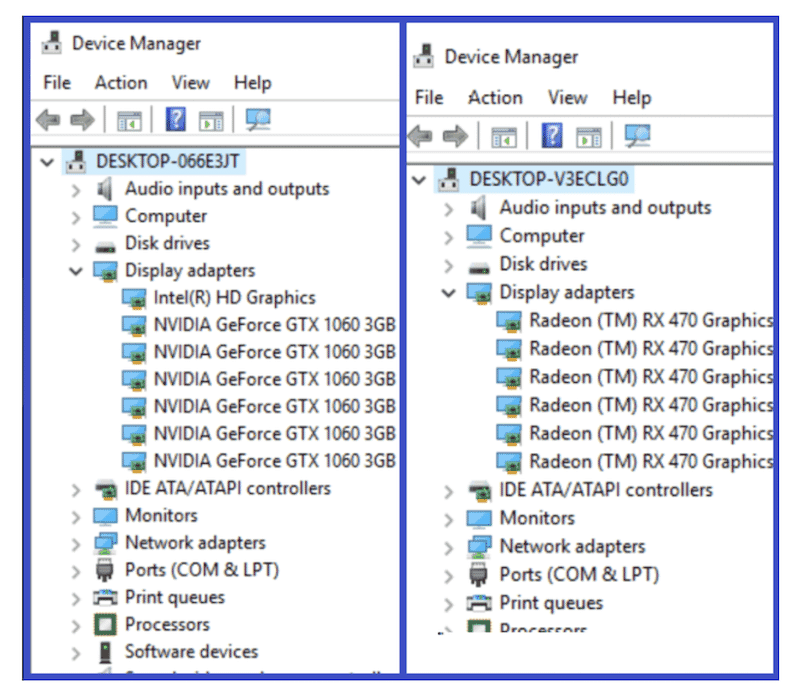 Enter your GPU information, and click Display Results. 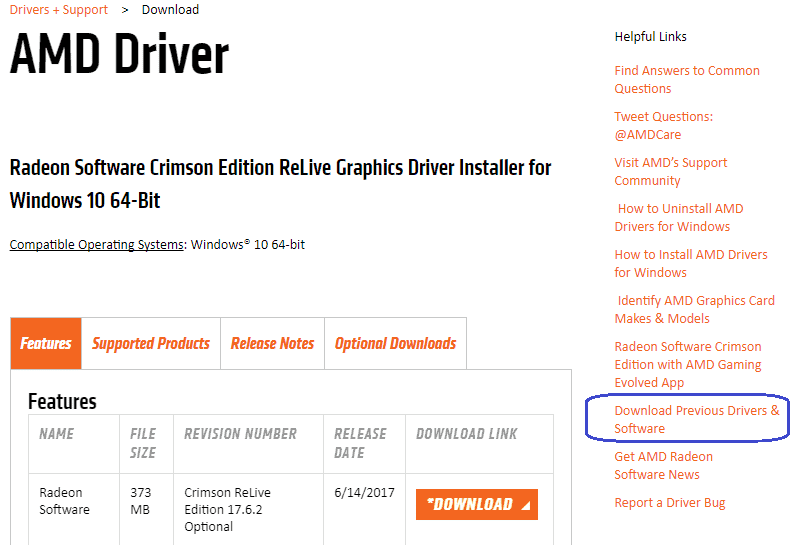 Click the Download button to get the latest driver version. Click the orange download button to get started. Troubleshooting tip: If you have multiple GPUs, you can either install all of them at once, or do it one-by-one. From my experience both methods work, so I suggest you start with installing them all at once to save some time. If you run into an issue (e.g. get a warning sign), delete the drivers and try installing them one by one.. To remove your drivers properly, use the DDU (Display Driver Uninstaller) program from Guru3d.com to remove everything cleanly. Start over only after you successfully removed your drivers. Before setting up your miner, you will need to have a Zcash wallet address. This is crucial since the coins you are about to mine need to have an address to be sent to. There are several options to choose from, however, I always recommend using a hardware wallet, if you can afford one. Read our wallet guide here for more explanations on wallet types and reviews of dedicated Zcash wallets. The next step is to download the EWBF Mining program. Important: Only download miners from the official threads in BitcoinTalk! Some miners have been used in the past as an attack vector. If you scroll down, you’ll see a couple of different download options. We’re going to use the Mega download link for the Windows miner. Note that when you download self-contained miner files, Windows may provide a warning. If you’ve used EWBF’s official download links, you can ignore this. First, you want to prevent your computer from going into sleep mode, as this will interrupt your mining. To do that, go to your Windows Power Settings and set Turn Off/Sleep to ‘Never’. Next, modify your system page file and manually set it to 16384 MB (16GB) using this guide. Consider turning off your Windows automatic updates, as they can also interfere with your mining and settings. To do that just click your Windows icon > windows update settings > Advanced options and turn off automatic updates. This step is optional and you can leave them on, just remember that they can’t always be predicted and some will reboot your system, and as a result stop your miner’s work. If you’re running Windows Defender or some other antivirus program, add an exclusion to it so that it doesn’t flag the entire EWBF folder. You are now ready to configure your miner to join a mining pool. Note that you can also use your miner to mine solo, however it is unlikely to make you any Zcash unless you have a warehouse full of GPUs. First, you will need to choose a Zcash mining pool. In this example I will use Flypool, though there are plenty of other pools to choose from. Regardless of the pool you choose, its home page or help section will likely contain instructions on how to join and mine using the popular EWBF Miner. We’re going to paste this string into the flypool bat file inside the EWBF Miner folder we extracted earlier. The bat file is a batch file that gives the commands to run the miner application. Locate the EWBF folder you extracted earlier, right click on “flypool.bat” and hit ‘Edit’. Paste what you’ve copied from the flypool website. I’m going to update my server to “us1” instead of “eu1,” and I’m also going to remove the “—cuda_devices” language at the end. This language is used if you want to designate mining only to certain devices (for example, if you want to game with one GPU and mine with the other two). If you want to mine with all devices, you can delete the —cuda_devices designation. Next, copy your Zcash wallet address. To do that, paste your Zcash wallet address inside the bat file (in the example above replace the address that starts with “t” and ends with “DX”). You can also change the worker name. In this case it’s .rig1, but you can call it .miningRig1 for example. Choose File > Save As and type “.bat” after the name. In the Save As type box, make sure you select All Files, then click Save. Congrats—you now have a batch file ready to mine! Create a shortcut for the new bat file and send it to your desktop. You can then delete the text version of the file. Step 6: Start Your Miner! Double-click your bat file to start the miner. The miner will start, initialize each of your GPUs and hash away. That’s it for the beginner’s guide on mining Zcash on your PC! I hope you’ve found this guide useful! In the video, I quickly cover overclocking and turning down your power consumption via MSI Afterburner, so make sure to watch it as well. If you run into any issues or have any questions, comment here in the blog or in the video comments, and I’ll try to help as much as I can. If you’re interested in taking your crypto mining to the next level, sign up at Crypto Mining Academy, where I go massively in-depth, detailing every step of this process in a comprehensive course. Happy mining! Crypto currency is the latest investment method for many people these days. Specially after bitcoin there have been hundreds of new crypto currencies were created and people are investing on them. the reason is simple. they are definitely getting more valuble each day and no one, even government can tax you or take your money away. when using or holding crypto currencies you get the maximum privacy. EWBF Miner? EWBF is seems to take 10-20% of real dev fee. Avoid it. Maybe this is why EWBF Miner is less efficient than dstm. 3 mothts ago, I mined Zcash, but now profit is very low. Now i mining altcoins, for example Stipend, FOLM, and other. Now i now a lot of other algo and how they mining with ***Link removed*** how to mine online for example. Hey can you please tell me what you think? Is it a good Rig? Can you tell me what you know about it and whats the rate and ROI? Pl help me. I have i7 PC with 8GB RAM. intel Graphic. Could someone let me know how to mine directly to a hardware wallet (trezor)? I did everything you said but when I try to start mining it says “cannot connect to the pool” what am I doing wrong?